It’s harder than you might think to look at a microscope image of an untreated cell and identify its features. To make cell characteristics visible to the human eye, scientists normally have to use chemicals that can kill the very cells they want to look at. A groundbreaking study shows that computers can see details in images without using these invasive techniques. They can examine cells that haven’t been treated and find a wealth of data that scientists can’t detect on their own. In fact, images contain much more information than was ever thought possible. Steve Finkbeiner, MD, PhD, a director and senior investigator at the Gladstone Institutes, teamed up with computer scientists at Google. Using artificial intelligence approaches, they discovered that by training a computer, they could give scientists a way to surpass regular human performance. The method they used is known as deep learning, a type of machine learning that involves algorithms that can analyze data, recognize patterns, and make predictions. Their work, published in the renowned scientific journal Cell, is one of the first applications of deep learning in biology. Finkbeiner and his team at Gladstone invented, nearly 10 years ago, a fully automated robotic microscope that can track individual cells for hours, days, or even months. As it generates 3–5 terabytes of data per day, they also developed powerful statistical and computational methods to analyze the overwhelming amount of information. Given the sheer size and complexity of the data collected, Finkbeiner started to explore deep learning as a way to enhance his research by providing insights that humans could not otherwise uncover. Then, he was approached by Google. The company has been a leader in this branch of artificial intelligence, which relies on artificial neural networks that loosely mimic the human brain’s capacity to process information through many layers of interconnected neurons. It was a perfect fit. Finkbeiner needed advanced computer science knowledge. Google needed a biomedical research project that generated sufficient amounts of data to be amenable to deep learning. Finkbeiner had initially tried using off-the-shelf software solutions with limited success. This time, Google helped his team customize a model with TensorFlow, a popular open-source library for deep learning originally developed by Google AI engineers. Although much of their work relies on microscopy images, scientists have long struggled to detect elements within a cell because biological samples are mostly made up of water. Over time, they developed methods that add fluorescent labels to cells in order to see features the human eye normally can’t see. But these techniques have significant drawbacks, from being time-consuming to killing the cells they’re trying to study. Finkbeiner and Eric Christiansen, the study’s first author, discovered that these extra steps are not necessary. As it turns out, images contain much more information than meets the eye—literally. They invented a new deep learning approach called “in silico labeling,” in which a computer can find and predict features in images of unlabeled cells. This new method uncovers important information that would otherwise be problematic or impossible for scientists to obtain. The deep network can identify whether a cell is alive or dead, and get the answer right 98 percent of the time. It was even able to pick out a single dead cell in a mass of live cells. In comparison, people can typically only identify a dead cell with 80 percent accuracy. In fact, when experienced biologists—who look at cells every day—are presented with the image of the same cell twice, they will sometimes give different answers. Finkbeiner and Nelson realized that once trained, the network can continue to improve its performance and increase the ability and speed with which it learns to perform new tasks. So, they trained it to accurately predict the location of the cell’s nucleus, or command center. The model can also distinguish between different cell types. For instance, the network can identify a neuron within a mix of cells in a dish. 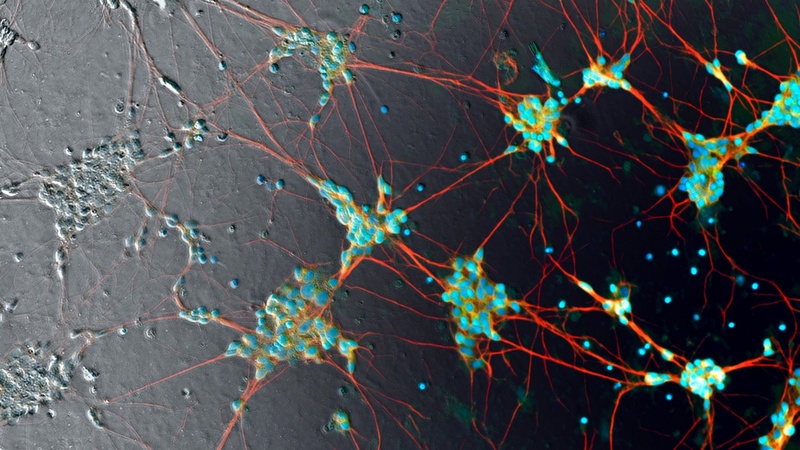 It can go one step further and predict whether an extension of that neuron is an axon or dendrite, two different but similar-looking elements of the cell. Certain applications of deep learning have become almost commonplace, from smartphones to self-driving cars. But for biologists, who are not familiar with the techniques, the use of artificial intelligence as a tool in the lab can be difficult to fathom. The potential biological applications of deep learning are endless. In his laboratory, Finkbeiner is trying to find new ways to diagnose and treat neurodegenerative disorders, such as Alzheimer’s disease, Parkinson’s disease, and amyotrophic lateral sclerosis (ALS). Without knowing the classifications of a disease, a drug could be tested on the wrong group of patients and seem ineffective, when it could actually work for different patients. With induced pluripotent stem cell technology, scientists could match patients’ own cells with their clinical information, and the deep network could find relationships between the two datasets to predict connections. This could help identify a subgroup of patients with similar cell features and match them to the appropriate therapy. With the help of artificial intelligence, the number of features that can be obtained from images is nearly infinite. The limits of human imagination may be the only remaining factor. To learn more, read the news release published by the National Institutes of Health or the Google Research Blog post. Other contributors to this study include Ashkan Javaherian, Gaia Skibinski, Elliot Mount, Kevan Shah, Alicia K. Lee, and Piyush Goyal from Gladstone; Samuel J. Yang, D. Michael Ando, William Fedus, Ryan Poplin, Andre Esteva, and Marc Bendi from Google; and Scott Lipnick, Alison O’Neil, and Lee L. Rubin from Harvard University. The research was funded by Google, the National Institute of Neurological Disorders and Stroke of the National Institutes of Health, the Taube/Koret Center for Neurodegenerative Disease Research at Gladstone, the ALS Association’s Neuro Collaborative, and The Michael J. Fox Foundation for Parkinson's Research.